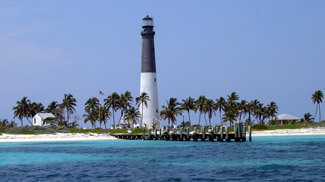 Even after the establishment of a lighthouse on Garden Key in 1826, wreckers were still making a good living by assisting ships that had run aground on the surrounding nearly eighty-square-mile grouping of reefs, shoals, and islands known as the Dry Tortugas. The wreckers, a term used both for the vessels and the men engaged in the salvage operations, were tightly regulated by the government. To obtain a license, the captains had to be men “innocent of any fraud” and their ships “seaworthy, and properly and sufficiently fitted” to assist vessels in distress. An admiralty court was established at Key West, where William Marvin served as judge from 1839 to 1863. It was Judge Marvin’s duty to determine an appropriate reward for the wreckers based on the immediate risk to the stranded ship, crew, and passengers, the value of the cargo, the amount of skill required of the wreckers, and the length of the operation. 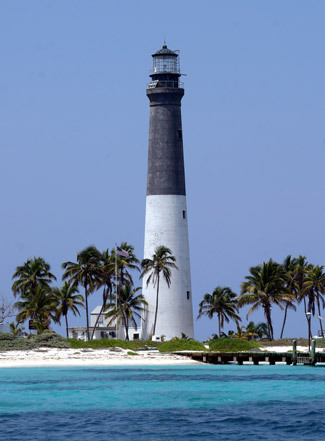 To curtail the number of ships being lost, Congress appropriated $35,000 on August 18, 1856 for the establishment of a second, more powerful lighthouse in the Dry Tortugas. 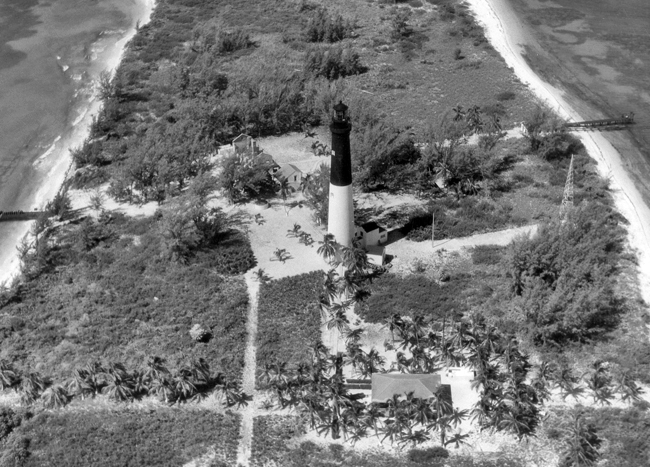 The new 150-foot tower would possess a first-order Fresnel lens and stand on Loggerhead Key, three miles west of Garden Key and at the western extreme of the islands. 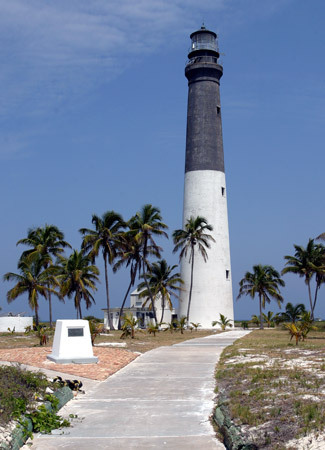 Captain Daniel P. Woodbury, who at the time was overseeing the construction of Garden Key’s Fort Jefferson, was also put in charge of building Dry Tortugas Lighthouse. Following Woodbury’s plans, the conical brick tower would enclose a spiral staircase consisting of 203 granite blocks that lead upwards to the watchroom, on top of which rested the lantern room. Twelve feet below the watchroom, the tower’s brickwork started to flare out to support an exterior walkway encircling the watchroom. The Fresnel lens, supplied by L. Sautter & Company of Paris, France, produced a steady white light and was first illuminated on July 1, 1858. The housing for the keepers consisted of a two-story duplex for the principal and an assistant keeper, and a second two-story structure, whose top floor served as living quarters for a second assistant keeper and whose ground floor was used as a communal kitchen. Other structures at the station included a two-story, freestanding brick oil house, and two brick cisterns, which collected the rainwater from the roofs of the two dwellings. 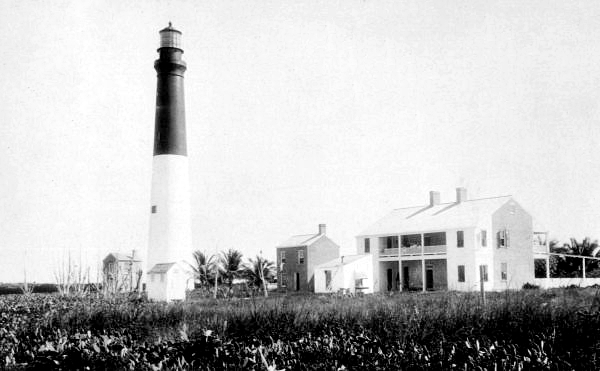 The first head keeper was Benjamin H. Kerr, who was transferred to Loggerhead Key Lighthouse after nine years of service at Garden Key Lighthouse. In a report filed in 1860, G. Phillips, who was stationed at Fort Jefferson, recounted the ‘incident’ that occurred at Loggerhead Key. The two assistants at the lighthouse were not enamored with Kerr, and, at that time, neither were Kerr’s wife and eldest daughter, for the four banded together and made an attempt on the keeper’s life. Kerr managed to defend himself with a carving knife, and then fled to Garden Key in a small boat, accompanied by a sympathetic daughter. 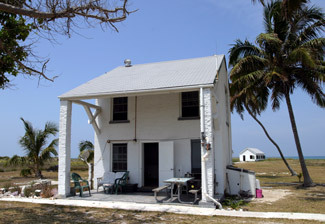 The two exiles soon left for Key West, but apparently the parties were later reconciled as Kerr is listed as the head keeper at Loggerhead Key until 1861. The old part [of the tower], for a distance of 8 or 9 feet below the lantern, including watch-room walls, has been entirely rebuilt, and the anchors of the lantern extended downward through the entire distance without in any way interfering with the regular exhibition of the light. When it is remembered that the tower is about 150 feet high, the difficulty in making these repairs will be better appreciated. They were accomplished by cutting out the old masonry in narrow vertical sections, replacing each section entire before removing the next. The patched tower was regularly inspected for soundness, and the repairs were found to be so effective that the plans for a replacement tower were abandoned. A red sector was placed in the lens on April 30, 1893 to alert mariners of a reef just offshore from the lighthouse. Then, in 1909, the Lighthouse Board purchased a second-order bivalve lens for the tower. The large, eye-like lens floated on a pool of mercury, enabling the lens to be easily rotated to produce a white flash every twenty seconds. Mariners reported that confusing, secondary flashes were produced by the new lens. It was determined that the undesirable flashes were caused by direct light from the lamp passing between the outer rings of the lens’ prisms, and thin vertical copper screens were installed in the lens to correct the problem. Generators were placed in a frame addition to the former oil house in 1931 to produce electricity for the light. 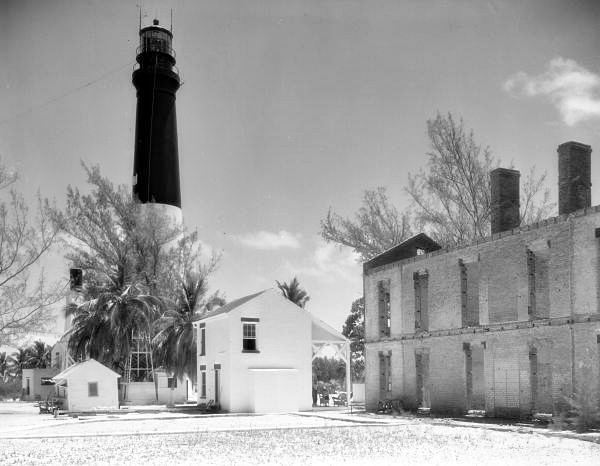 In October of that year, a photometer was set up atop the walls of Fort Jefferson, three miles from Loggerhead Key, and tests were conducted to measure the effectiveness of three different light sources: an incandescent-oil-vapor lamp, three 250-watt electric bulbs, and one 500-watt electric bulb. The results indicated that the single bulb produced a flash of 985,000 candlepower, while the trio of bulbs produced a flash of 404,000 candlepower, and the incandescent-oil-vapor lamp a flash of just 151,000 candlepower. On the night of September 22, 1933, the crew aboard the S.S. Joseph R. Parrott, bound from Mobile to Key West, reported seeing the powerful beam from Loggerhead Key at a distance of 53.6 miles. In 1986, the mercury float was damaged and the revolving lens came to a stop. After disposing of the toxic mercury, the Coast Guard replaced the lens with a DCB-24, and then in 1995 with a VRB-25. 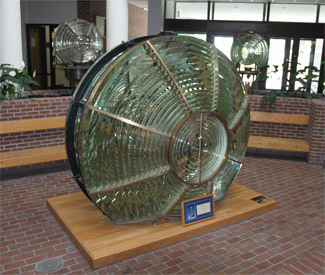 The classic bivalve lens is on display at the National Aids to Navigation School in Yorktown, Virginia. 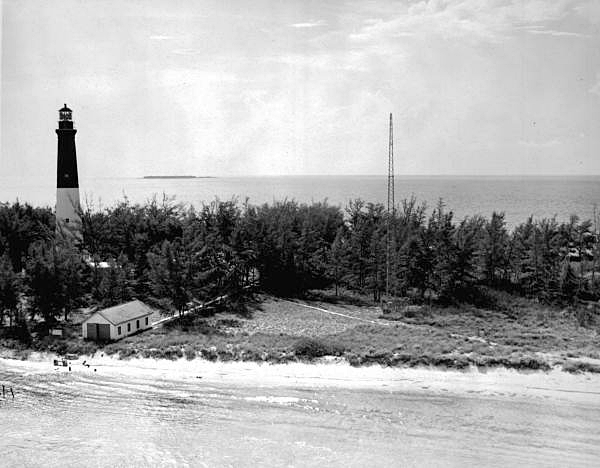 The first radiobeacon in Florida was established on Loggerhead Key on December 21, 1927. 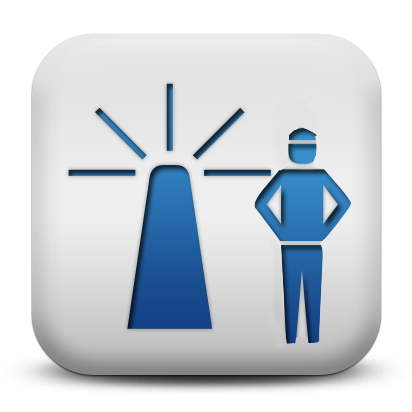 During thick or foggy weather, the beacon continuously transmitted groups of three dashes for one minute followed by two minutes of silence. The same signal was transmitted in clear weather between 2 and 2:20 and 8 and 8:30, a.m. and p.m. 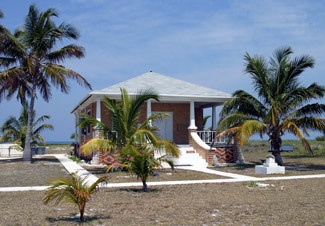 The two-story keepers’ dwelling burned in 1945 and had to be razed, however, a new one-story, yellow-brick bungalow topped with a hipped roof had been built for the head keeper in 1922-1923 at a cost of $6,498, so housing on the island remained sufficient. The lighthouse was automated in 1987. Today, volunteers stay in the original building that served as a kitchen and dwelling and keep an observant eye on the property. The 1922 bungalow is used by the Coast Guard to house crews during routine maintenance visits to the lighthouse. Created in 1992, Dry Tortugas National Park encompasses all seven islands in the Dry Tortugas along with the surrounding coral reefs and shoals. 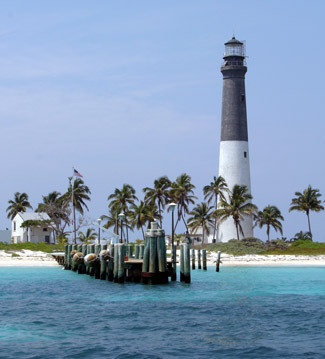 As part of the enabling legislation, the lighthouse and other Coast Guard buildings on Loggerhead Key were transferred to the National Park Service, though the Coast Guard is still responsible for the light. The turtles, which continue to return to the island to lay their eggs, can now do so without fear of being turned, harassed, or eaten. Head: Benjamin H. Kerr (1858 – 1861), James P. Lightburn (1861 – 1862), Robert H. Thompson (1862 – 1872), William B. Taylor (1872), Thomas Moore (1872 – 1880), Harry W. Magill (1881), Robert H. Thompson (1881 – 1888), Charles A. Roberts (1888), George R. Billberry (1888 – 1907), Edgar J. Russell (1907 – at least 1915), Charles Johnson (at least 1917 – at least 1921), Andrew M. Albury (1928 – at least 1947). First Assistant: Charles H. Perry (1859 – 1860), J. Bryson (1860), William Bates (1860 - 1862), John Thompson (1862 – 1863), J.C. Whalton, Jr. (1863 – 1864), John Thompson (1864 – 1868), Benjamin F. Bush (1868 – 1869), Charles Hall (1869 – 1870), William B. Taylor (1870 – 1872), Thomas Moore (1872), James Martin (1873 – 1876), Joseph C. Fontane (1876 – 1878), John J. Larner (1878 – 1880), Francis W. Knight (1880 – 1882), William A. Bethel (1882 – 1885), Charles A. Roberts (1885 – 1888), John Watkins (1888 – 1890), Calvin L. Park (1890 – 1896), Samuel W. Lowe (1896 – 1901), Alfred A. Berghell (1901 – 1902), Chester W. Roberts (1902), Lucius H. Deason (1902 – 1903), Willard R. Johnson (1903 – 1908), William Felton (1908 – 1911), Holton M. Roberts (1911 – at least 1917), Ludwig Bethel (at least 1919 – at least 1921), Andrew M. Albury (1927 – 1928), Stanley S. Saunders (at least 1929 – at least 1940), Warren Bennett (at least 1940). Second Assistant: John Fritz (1859 – 1860), F. Knoblow (1860), John Dyer (1860 – 1861), W. Roberts (1861 – 1862), William Gray (1862), John Camaler (1862 – 1865), John Trow (1865 – 1866), Joseph Thompson (1866 – 1867), Charles P. Willard (1867), Simon Frow (1867 – 1868), John A. Messina (1868 – 1869), Jeremiah Buckley (1869 – 1873), James A. Lockhart (1873 – 1875), Joseph C. Fontane (1875 – 1876), Charles R. Johnson (1876 – 1877), Rudolph Wentzel (1877 – 1878), Josephus Packer (1878 – 1879), William S. Solomon (1879), Frank W. Knight (1879 – 1880), William A. Bethel (1880 – 1882), Charles A. Roberts (1882 – 1885), Louis Italy (1885 – 1888), John Watkins (1888), Calvin L. Park (1888 – 1890), Henry Johnson (1890 – 1903), Harry B. Lester (1903 – 1905), Henry A. Keyes (1905 – 1907), George E. Billberry (1907 – 1910), Richard Palmer (1910), George W. Mobley (1911), Robert R. Knowles (1911 – at least 1912), C. Johnson (at least 1913), Theophilus Sawyer (1914), Sterling C. Gardner (1914), Benjamin R. Knowles (1915), William W. Roberts (1916 – ), Robert J. Fine (at least 1919), C.G. Turner (at least 1923), Andrew M. Albury (1925 – 1927), Osmond M. McKinney (at least 1931), Benjamin H. Lowe (at least 1932 – at least 1933), Antonio Canalejo (at least 1939), Walter Light (at least 1940). Third Assistant: Edward E. Riles (1929 – 1931), Benjamin H. Lowe (1931), Wallace L. Bierer (1932 – 1936), Willard A. Albury (1936 – ), Charles W. Mackie (1937 – 1939), Charles L. Perez (1940 – 1941). Lighthouse Service Bulletin, various years. 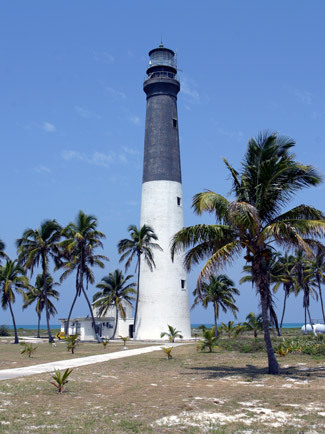 Lighthouses of the Florida Keys, Love Dean, 1998. 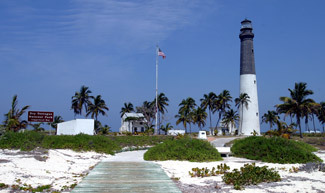 Located on Loggerhead Key, the westernmost key in Dry Tortugas National Park. 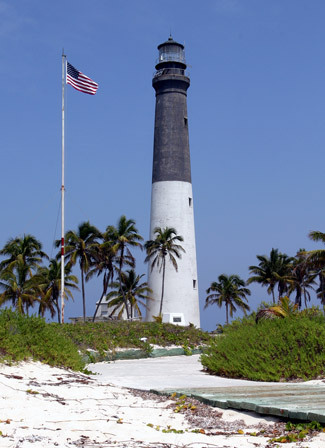 For a larger map of Dry Tortugas (Loggerhead Key) Lighthouse, click the lighthouse in the above map. 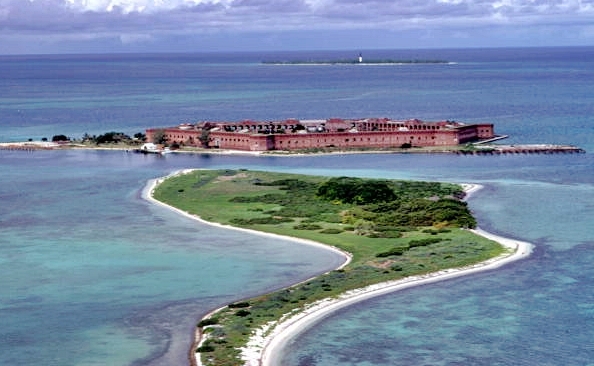 Dry Tortugas National Park can be reached by seaplane or by the Yankee Freedom ferry. The ferry only provides access to Garden Key, from where a distant view of Loggerhead Key is possible. To land at Loggerhead Key, you must take your own boat or go with a guide who has a permit issued by the park. The pier at Loggerhead Key is closed to the public. 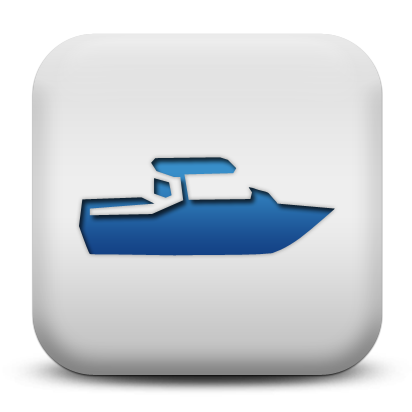 Therefore, you must access the island by anchoring offshore and either wading or taking a small boat ashore. The lighthouse is owned by the National Park Service. Grounds open, tower closed. At the northern tip of Loggerhead Key is a monument to Alfred Goldsboro Mayor who founded a marine research laboratory on the island for the Carnegie Institute and served as its director for seventeen years. Scientists who worked at the lab are credited with taking the first underwater black and white and color photographs using the nearby reefs as subject matter. A couple of other markers are also found on Loggerhead Key. One near the dock marks the grave of Wally, “A Friend to All," who was brought to the island by the Coast Guard as a pup, and remained until his passing in 1990. Near Wally’s grave is a monument to the Cuban refugee boat Rafaela, which apparently made it to the island on May 20, 2001. The arrival of Cuban refugees in the national park is still quite common. There was a boat of questionable seaworthiness on the beach at Garden Key that had made the ninety-mile voyage from Cuba just days before our visit. There are also two sets of remains at Loggerhead Key that are worth a look. The foundation of the original keepers' duplex can be seen adjacent to the white cookhouse/dwelling. The remains of the Windjammer Avanti can be visited just a mile southwest of Loggerhead Key. The three-masted ship struck the reef in 1907. The Avanti lies in shallow water and is the most complete shipwreck in the park. Colorful coral and fish have now commandeered the ship.